We started out with oh-so-many delightful baby names borrowed from the Wizarding World of Harry Potter. There’s Harry, of course, and Hermione. But also slightly more obscure choices, like Rowena and Phineas. Thanks to your votes, we narrowed those down to two finalists in both the Witches’ Final Match-up and the Wizards’ Last Showdown. We have winners in both contests to celebrate! In the final round of the wizards’ #boynames contest, dashing Cedric matched up against regal Arthur. Arthur is a long-time favorite here at Appellation Mountain, a past winner of our annual March Madness competitions, and a rising classic name, too. It’s also been a clear favorite since we first set foot in Hogsmeade earlier this month. Plus, how can you not just love the brave, principled, and affectionate father of the Weasley family? So maybe it’s no surprise that the name sailed past Cedric handily, 62% to 38%. Though it’s worth noting that Cedric fared really well in our contest, too. Could it be that the late, great Cedric Diggory will eventually help this neglected gem make it back into the mainstream? Maybe! But this year, we’re handing the mug of celebratory butterbeer to Arthur. On the witches’ side, the prize goes to Luna. Again, Luna was an early leader, winning the initial round and besting all of her competition handily. Except in this round. Luna faced down Rowena, one of the co-founders of Hogwarts School of Witchcraft and Wizardry. Rowena Ravenclaw’s name lives on in one of the school’s four houses. And for a few brief moments, Rowena held the slimmest of leads! In the end, Luna eked out a respectable 53% to Rowena’s 47%. In real life, of course, Luna is ascendant, probably the most successful of all the Harry Potter-inspired choices. Sometimes heard in the nineteenth and early twentieth centuries, the Latin word for moon had fallen out of use for years. Then came the off-kilter, but fiercely loyal and extremely capable Luna Lovegood. She met Harry in the fifth book, The Order of the Phoenix, published in 2003. That same year, the name re-entered the US Top 1000. And two years ago? It cracked the US Top 100, a night-sky name with an on-trend sound. 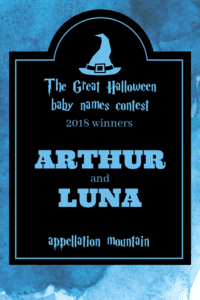 Raise a glass of pumpkin juice to the winning witch name, Luna! That’s all for this year! Thanks to everyone for voting, and sharing your love of all things Harry Potter along the way. The post Great Halloween Baby Names Contest 2018: The Winners! appeared first on Appellation Mountain.